Breslin Ridyard Fadero Architects and Counsilman-Hunsaker designed Penn State’s world-class natatorium, located inside the Capitol Union Building. The natatorium provides the backdrop for Penn State’s swim athletes and various local schools to use for meets and training. The aquatic center was planned by a group of committed citizens, elected officials, administrators from five local municipalities, and Penn State representatives. Their vision created a partnership among Highspire, Londonderry Township, Lower Swatara Township, Middletown, Royalton, and Penn State Harrisburg, making it possible to design a state-of-the-art facility that provides the communities and university access to year-round aquatic programming. The aquatic center swimming pool is uniquely designed to permit maximum use for aerobics, swimming lessons, workouts, wellness, and leisure. The 9,000 sq. 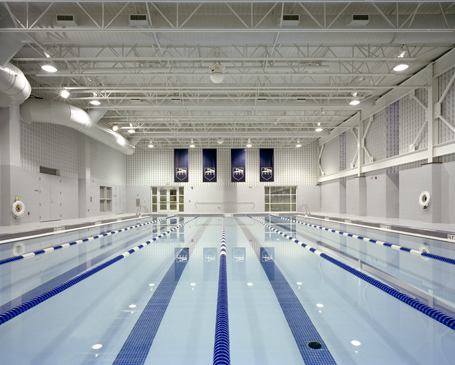 ft. complex provides a six-lane lap pool (37 ft. x 75 ft.). Other programming spaces include a fitness center and gymnasium, readily available to student athletes for working out and keeping in top form for aquatic competitions.